This “forum” is actually a blog. Here you can ask questions about Scientology, no matter what type of questions or how stupid they may sound. I’ll answer them and have done so since February 2008! There have been up to 30 questions per day and sometimes it takes a bit for to answer. Please be patient. I would hate to miss one of your comments or questions. 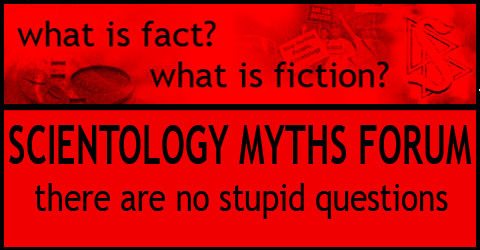 Repeating questions go over to the ScientologyMyths.info page. Note: This blog is set up as a free WordPress blog. That means WordPress collects data on visitors and publishes them on Quantcast.com. I don’t know who you are and only if you leave a comment I would even be able to see your IP address. Stay as anonymous as you want, use hidemyass.com or other tools as you like. My point and the reason why I set up this site is to answer questions about Scientology. So go ahead and ask! I am a Scientologist, working, and I use my spare time to run this blog and the website scientologymyths.info. I live in Los Angeles, California/USA. Personal questions are only ok on personal mail ll@scientologymyths.info, but don’t expect me to do the soul stripper number here. Anyway, I am an online and news junkie but I also enjoy computer-free days. My friends call me Luana. Online this has caused some confusion as recent as March 08 so I decided to go by my full name Louanne (I was mistaken to be Luana Lani, an “exotic Filipina model”. YEAH, RIGHT, boyz! I am taller than that…!). Don’t send me flowers. I am serious. I don’t know and you can chose to be whoever you want. You tell me. Sure a more balanced view on Scientology, the Church of Scientology and L. Ron Hubbard. If you want to be a fanatic extremist, go away, the information here could be dangerous for you. Not many. Actually there is only ONE RULE: Don’t trash this place! I don’t want statements or lengthy introductions to your questions. Just as you I like to spend my time on something useful and to go through three pages of copypasta is not part of that. 20 Feb 08 Update: Free speech goes in two directions. Those who try to harm mine will be deleted. There are plenty of places to spread rants, personal attacks or perverted statements and I will keep this place clean of those. 21 Feb 08 Update: Comments are not moderated here. WordPress however throws comments automatically in a moderation cue if they have more than one active link in them. So if you want to see your comment on the blog immediately don’t put more two or more links in them, or wait until I come home. 22 Feb 08 Update: The blog got 495 spam comments in the last 24 hours, all reliably caught by the spam filter so you did not see them. Before last night I got less than one spam post per day. So somebody here tries to prevent you and me to exert Free Speech by trashing up this place. If you know who it is, let me know. I’ll talk to anybody and I am curious to get to know spammers personally. 10 March 2008 Update: I wanted to put a Technorati button on the blog, but they only come in ugly green, so I put it here: . If you like this blog, click on it. 24 March 2008 Update: The discussions on this blog sometimes turn in circles, mainly because of returning visitors trying to be funny by resubmitting questions which have been answered several times already. To solve this I will concentrate on beefing up ScientologyMyths.info in the coming weeks. 22 April 2008 Update: Closed some threads (more than 400 entries make them unreadable) and opened new ones. I am currently on tour and not so much around than before. Please send urgent stuff to my email (louanne@scientologymyths.info) but PLEASE do not hesitate to ask questions. I am very interested in what you have to say and ask. 12 July 2008: I didn’t think I would spend my vacation nights hanging in front of my laptop, administrating Scientology Myths. But so it is. I have 6am here and must admit it is fun to see that this blog is alive and well. Opened a new “Ask me” thread here. Good night. 13 April 2011: Here is the newest “Ask me” thread. Thanks! I almost didn’t see your comment ’cause I thought I’d closed the comments here.